9th October 1918, aged 20. INSCRIPTION. OH FOR THE TOUCH OF A VANISHED HAND AND THE SOUND OF A VOICE THAT IS STILL. Son of Henry R. and M. Martin, of 10, Carmalt Gardens, Putney, London. Native of Adelaide, South Australia. 22nd April 1917, aged 29. Son of Paul and Mary O'Neill, of Admiral's Cove, Ferrneuse, Newfoundland. The inscription on his headstone reads; "Sacred heart of Jesus have mercy on his soul. May he Rest in Peace." 3rd May 1917, aged 23. Son of Thomas and Georgina Owen, of Balfour Street, Clarksfield, Oldham. His headstone bears the following inscription; "Thou hast raised my soul from the grave. Underneath are the everlasting arms." 13th April 1917, aged 29. Son of Frank and Mary Lorina Peskett, of Lowestoft, Suffolk. Son of Elsie Price, of Leytonstone; husband of Amy Rosina Price, of "The Glen," 2, Glengarry Rd., Dulwich, London. 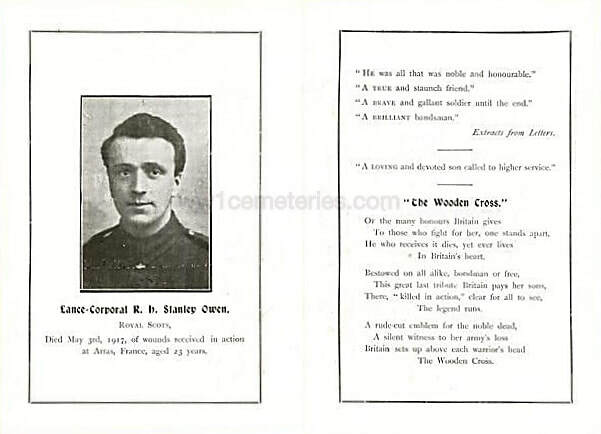 Husband of Louisa Ellenor Draper (formerly Randall), of 15, Elmcroft Cottages, Frimley Green, Farnborough, Hants. 15th May 1917, aged 37. Husband of Mary E. Scotney, of High St., Elton, Peterborough. He was born on 4th August 1881 in Nassington, Northamptonshire, so was 35 years old when he died (not 37 as stated in official records). He was the husband of Mary Elizabeth Scotney of Elton, Huntingdonshire and the father of 4 daughters at the time of his death. 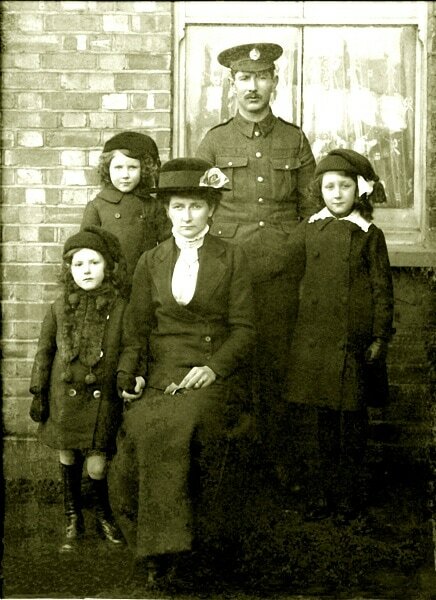 My mother Annie Elizabeth Scotney was born in Elton on 24th June 1917, 5 weeks after William's death. Killed in action: 12th April 1917, aged 37. Son of Alfred and Martha Thomas, of Acton; husband of Edith Grace Tucker (formerly Thomas), of 6, Long Drive, East Acton, London. Son of Charles and Margaret Thompson, of Mount of Glosat, Milton of Campsie, Stirlingshire. 24th September 1918, aged 28. 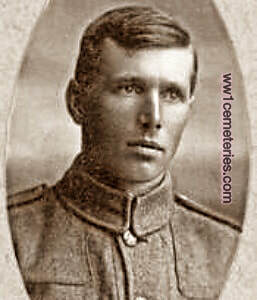 Son of Harry and Emily Underhill, of 78, Hillsdale Avenue, Toronto, Canada. 3rd September 1917, aged 24. Son of George and Martha Ann Wensley, of 22, Church Lane, Robert Town, Liversedge, Yorks. 27th April 1917, aged 20. Son of William and Ellen Wilde, of 33, Haigh St., Greetland, Halifax, Yorks. Wounded in the early hours of 25/4/17 when the Battalion attacked Bayonet and Rifle trenches between Monchy and Rouex. Nephew of Mrs. F. Gilbert, of Alma Cottage, Common Rd., Claygate, Surrey. My grandfather had been sent home on compassionate leave as my grandmother was ill with cancer and according to stories, died one month after this picture was taken. Then my grandfather died leaving my Mother (upper left daughter) and her 2 sisters orphans. They were brought up by a maiden aunt.